The additional advantages of Epoxy Floor Coating? We can use different colors of epoxy floor coating products simultaneously to define safety zones,forklift traffic zones, and other work zones. 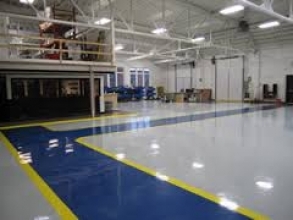 Using epoxy floor coatings in a factory, warehouse, or industrial plant can reduce wear on transport vehicles which allows for faster material movement, and prevent wear and damage to the floor. Our epoxy floor coatings are self-leveling products which allows our experienced professionals to apply an epoxy floor coating quickly over any new or old concrete floors. Epoxy floor coating installation is an affordable flooring solution from our professional and experienced epoxy flooring providers. The hard wearing and durable surface that results from our floor coatings will last for years to come with no need for maintenance or up keep costs. These high and low solid viscosity garage floor coating has superior strength bonds which make the system ideal for residential garage floors, office floors as well as industrial warehouse. Use in combination with the Kolour Koat Polypack line and the color combination options are endless.